※Above monitoring displays show actual images. For inspection of engine for automobile parts, etc. In addition to the bult-in-memory(64MB), it is also available to keep the memory in Micro SD　card(optional, by max.16GB) for static image and movie. As it is also able to record voice sound together with movie, it is very helpful to memorize the operation site, etc. 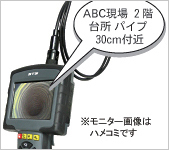 ※It must be very helpful if you record your operation site in voice sound over taking the movie. 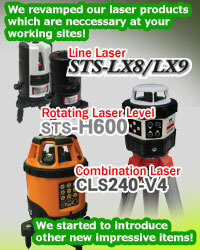 It helps you to find the operation site very easily later. Furthermore, it is also available to connect with computer using USB cable and to output data onto TV using AV cable. Using included applicaiton soft(ScopeView), you can manipulate the image over checking at both personal computer and endscope(Dual display). It will not be bothered even in wet, humid or dusty places thanks to water and dustproof equivalent to IP67. The main part is equivalent to IP54 thus you can touch with wet hand. Availavle to use it over fixing the shape. Available to insert the cable in a pipe if there is enought inner diameter even the pipe curves. Only with pushing a button, it enables to make the indication display rotate 180 ° and zoom. Due to hyper-brightness LED, it can keep the blightness in the dark place. In addition, the blightness can also be adjusted with the dial. As its tip tool, a side mirror, magnet and hook are provided as its standard. ※The monitoring image is composite one. ■AA rechargeable battery(1 pc. )《AA2300》※4 pcs. 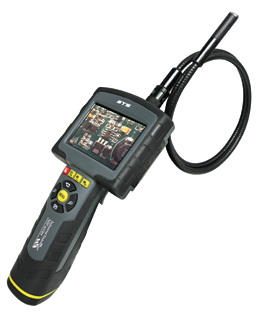 is neccessary for SDI Endoscope. 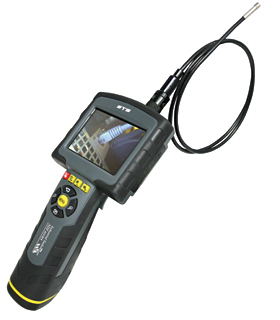 Water and dustproof Equivalent to IP67　※From camera cable to camera head at normal temperature and pressure. Power Supply AA Alkaline dry cell battery x 4 pcs. ※Mangan battery is not available.